The main emphasis is to nurture the joy of dancing. This is done by increasing strength, co-ordination and musicality as well as developing the child�s creativity and self-expression. The school is all- inclusive and children with varied learning and physical needs are fully integrated into the ballet classes. Generally the pupils attend Ballet Classes once a week but may attend more classes per week if they wish. This is in order to accommodate the busy lives of children with their increased workload at school combined with other activities. However in order for pupils to be fully prepared for ballet exams it is compulsory to attend an additional weekly exam coaching class in the term leading up to the exams. Ballet is an art form that requires a lot of training therefore regular attendance is advised. These classes are general ballet-based dancing lessons which serve as a basis for other dance classes. 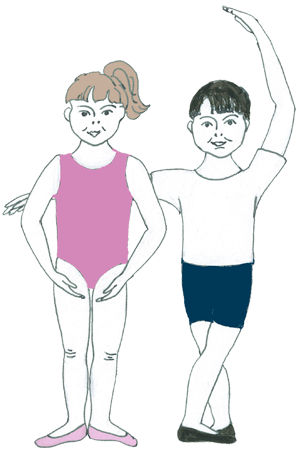 The children will receive a grounding in basic dance steps such as skipping and galops, working with a partner as well as creative movement. The classes are based on the syllabus of the Royal Academy of Dance as a structure upon which to build technique. Exams may be taken in the RAD syllabus but will require extra exam coaching as needed. The timetable is subject to change in order to accomodate the differing needs of the students. For example - at the moment we do not have a separate Grade 1 class or a Grade 5 class but these could be created if the need is there.